With half of Americans now owning a smartphone, it seemed only natural to the team at Palmetto Dunes to give its golfers a way to improve their experience on the green right on their iPhone, iPad or Android. The new golf application from Palmetto Dunes Oceanfront Resort gives players at its three award-winning courses everything from GPS on the course to insider tips on playing specific holes and a quick way to brag about their hole-in-one or birdie on Facebook—all at their fingertips. mini-tournaments and enjoy a built-in GPS to track yardage. here is also food and beverage information, including specials from Palmetto Dunes’ new Big Jim’s BBQ, Burgers and Pizza restaurant, which opened earlier this year at the Robert Trent Jones course, as well as the Grilles at the George Fazio and Arthur Hills courses. The app gives users the option to direct dial the restaurants to pre-order while finishing a round and reminds them at various holes. 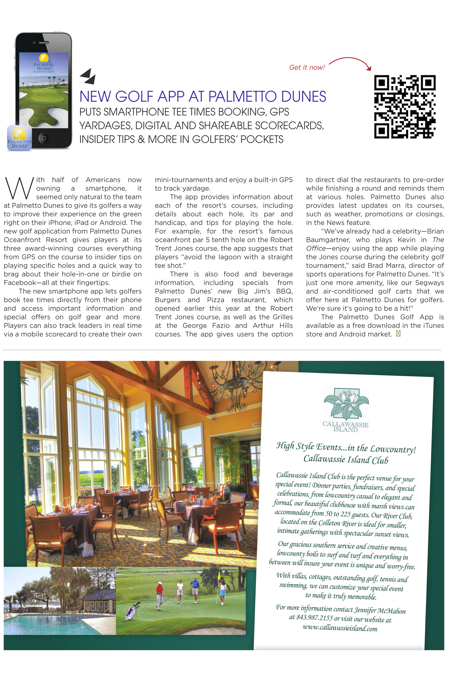 Palmetto Dunes also provides latest updates on its courses, such as weather, promotions or closings, in the News feature. The Palmetto Dunes Golf App is available as a free download in the iTunes store and Android market. He Said She Said "Bachelorette Contest"